After you successfully add your Maybank debit card on Google Wallet, you will make transaction right after clicking the Green colored " BUY " button. As soon as you clicked the Green highlighted " Buy " , your bank account will be deducted MYR 3.50. That would only work if you have registered your Maybank debit card on Google Wallet in prior. Do not attempt to click the green higlighted " Buy " button on your smartphone as if you have not made any decision. Maybank Debit Card is the easiest way and solution for individual who wanted to purchase Apps on Google Play. To get Maybank Debit card, you must meet the requirements of 18 years old and Malaysian citizen. Besides, Maybank staff would ask you to deposit up to RM500. As for student, it can go as low as RM50 only. Some of you may not know that tt is very important for Maybank debit card users to know the importance of Maybank debit card numbers before applying it. The numbers imprinted on card are highly valuable and only meant for the debit card user who applied it. are meant for your visibility. These numbers allowing you accessing your bank account to make transaction on Internet. These 16 digits were to be put into your Google Wallet for purchasing Google Play apps or in-game credits. Transaction will be saved on your Google Wallet account which is accessible by your Google mail account. The transaction made information is sent to both Google Wallet and your Google mail. " 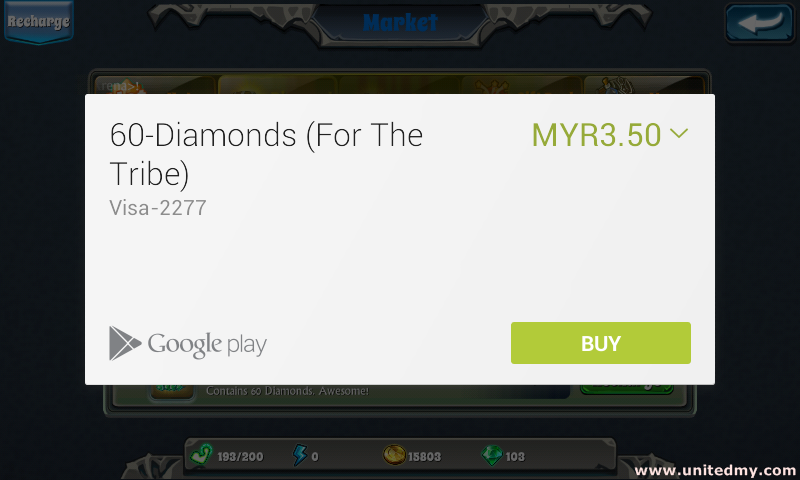 For The Tribe " is a game app on Google Play by Asiasoft Online charging MYR 3.50 for in-game item. Unitedmy author accepted the in-game item by exchanging MYR 3.50. Really good offer you shared. Very helpful post. However Get all the latest apps, games, and digital media with a Google Play card. Steam Card Delivery’s US Google Play Gift Cards mean you or a friend has millions of items at your fingertips whenever you want it.